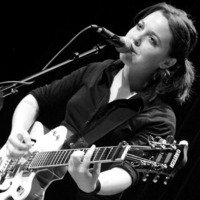 Erin McKeown (pronounced "mick-YONE") (born October 15, 1977) is an American multi-instrumentalist and folk-rock singer/songwriter. McKeown began her career in the folk scene. She released her first album, Monday Morning Cold, on her own label (TVP Records), travelling throughout New England while still a student at Brown University in order to promote the record. Although she had begun studying ornithology, she graduated from Brown with a degree in ethnomusicology. McKeown's music is difficult to categorize in terms of genre; it has touched upon pop, swing, rock, folk, and electronic music, as well as many other genres. Mckeown cites The Hitchhiker's Guide to the Galaxy as an influence on her music. McKeown continues to perform regularly, spending much of her time touring throughout the world with artists such as Ani DiFranco, Josh Ritter, the Indigo Girls, Martin Sexton, Andrew Bird, Thea Gilmore, Melissa Ferrick, Allison Miller, and others. McKeown also took part in Queerstock, a music festival dedicated to promoting LGBT musicians. Early in her career, she also collaborated with Beth Amsel, Jess Klein, and Rose Polenzani; the four of them performed as Voices on the Verge. McKeown's 2005 album, We Will Become Like Birds (produced by Tucker Martine), served as a departure from her earlier work, with a more rock-oriented sound. At a September 1, 2008, concert at The Gravity Lounge in Charlottesville, Virginia, McKeown told the audience that she wrote this album "in an attempt to write myself out of the worst heartache I'd experienced up to that point." Her next studio release, Sing You Sinners, was released in Europe on the 23 October 2006 and in the United States on January 9, 2007 by Nettwerk Records LLC. It consists mostly of covers of jazz standards from the 1920s through 1950s. McKeown's latest record, Hundreds of Lions, was released under Righteous Babe Records on October 13, 2009. Additionally, a series of web concerts recorded in 2009 are available at McKeown's website. McKeown is also currently member of an unsigned band known as "emma", which she created with her friend Allison Miller. McKeown has plans to write a book of poetry.